Booking Mama: I Won a Kindle from FSB!!!! I am absolutely speechless -- and that rarely happens! Earlier this morning, I received an e-mail from Julie at FSB Associates telling me that I had won their Kindle Giveaway! I am just so excited and I'm really having a hard time expressing how happy I am! I can't wait to actually get my hands on it! In celebration of Book Blogger Appreciation Week, everyone at FSB Associates would like to extend a heartfelt thank you to all book bloggers. We are so very grateful for your time and effort in helping us promote our books and authors. Your contributions to the book publishing industry are truly unquantifiable. Your caring, thoughtful reviews and attention have made so many authors very, very happy. I thank you on behalf of all of us at FSB for your continued support of books and authors. As a token of our apprecaition, we are giving away a Kindle 2 to one blogger! Enter for your chance to win by clicking here. Please also enter to join our directory of bloggers, which will be online at FSBMedia.com next month and will allow us to give you additional attention and visibility. Thank you again for your time and energy, and we look forward to working with you in 2010! Of course, I want to give a huge thanks to FSB for offering this giveaway (and picking my name!) But I also have to thank my very good friend Kathy, aka BermudaOnion, for bringing this contest to my attention. I was at Disneyworld and she sent me a Twitter Direct Message just to let me know about it -- isn't she a great friend? As soon as I have a chance to play with my new toy, I'll write a little review to let you know how much I love it! In the meantime, I'll just keep on doing my little "Happy Dance." Congrats! Hope you love it like I love mine. Congratulations. Glad you won. I'll probably end up buying myself one for Christmas. Congratulations! And I'm sure you already saw Bermudaonion's timely post about both the Kindle and Sony e-reader today! Fantastic! How awesome is that! Congratulations! You'll have to share how cool it is when you get it. I've only looked at one, never played with it. I look forward to hearing what you think! I'm using a lot of exclaimation points for some reason!!!! Congrats! I love my Kindle - hope you love yours too! Now that is an exciting win! 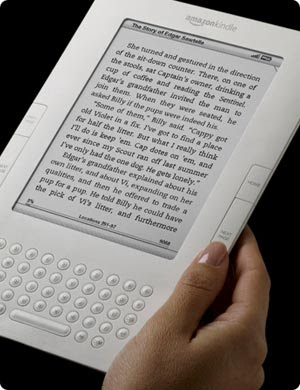 Now you don't have to choose between the kindle and the sony reader, as you commented on Kathy's post this morning. Congrats to you! Hope you enjoy yours as much as I like mine! That is so cool. Congratulations. Perhaps you can use your considerable influence to find out how Kindle readers can get ARC's. :) I ADORE my Kindle but would love it more if I could read ARC's, too. Congrats!! I really want one! I have not entered into ebooks yet...you'll have to share with us how you like your Kindle! That is so awesome! I can't wait to hear what you have to say about it. You've had a big week! That's awesome, Julie! You deserve it for all your great reviews and time you put in! A BIG CONGRATULATIONS TO YOU! That's how excited I am, I'm yelling!!! You made my month earlier when I was chosen as one of your winners of "Millie's Fling" and I'm glad that some of that luck was thrown your way. Enjoy!! I have the version 1 Kindle - but if you have any questions, I would be happy to help. Can you hear me screaming? Congratulations! I am so excited for you! WOW, Julie, how great this is! FSB is really fantastic. I hope you enjoy your new toy. Congratulations, Julie!! Speechless, huh? How long did that last!?? :) Enjoy! Congrats!!! I have a Kindle (a gift from my husband) and I LOVE it! And Bermudaonion is one great supportive blogger! Enjoy. I can't wait to see how you love it ... cuz you will! Congrats! I thoroughly love my Kindle! Enjoy! Yaaaaaaaay!!!!!!!! I'm so happy for you. Congrats! I have had mine for about a month now & love it! I find something nifty I like about it every day! As the other Jill said, totally awesome! Congratulations!!! Congrats! I've had mine for almost 2 years and I'm still in love with it! You can get ARCs from NetGalley. Let them know I sent you if you can! :) They don't always have a selection of books I enjoy but you might find something you like!